AWID (Association for Women's Rights and Development) is calling for proposals for its next international forum, which is to be held from November 14-17, 2008 in Cape Town, South Africa. The theme for next year's conference is the power of movements i.e. "what people without access to power cannot accomplish alone, they can accomplish together through collective action." At the conference women's right activists from around the world will gather to debate and strategize about how to build stronger women's movements globally. I've been trying to go since they held the conference in 2002 in Guadalajara, Mexico. Maybe I will be able to attend next year. To read about how you can submit a proposal, visit www.awid.org/forum08. My Calvin and Hobbes quote for the day on Facebook: "I'm learning real skills that I can apply throughout the rest of my life... Procrastinating and rationalizing." I used to be a serious TV addict back in the day. I had my favourite shows – at least one a day – which ensured that for at least an hour a day (more likely for 3, 4, 5 hours) I would be found glued to the television. Over the last 2 years though, I have barely watched any TV. However one of my "must-catch" shows is Unleash the '80s, which comes up on Silverbird TV every Sunday night at 11.15 (I’m really showing my age here but whatever. It's also a great way to start a new week). I don’t know how the show’s producers manage to find all those old videos, but each week promises for me a treasure trove of "oldies but goodies." Last week, they featured Anita Baker’s Same Ole’ Love and a song that I used to love called You’re my number 1, which turned out to be by a British singer called Princess. It is hilarious watching these videos, many of which now appear extremely cheesy and which comprise of little more than the artiste singing into the camera. It’s a rare '80s video that does not look dated in today’s era of sleek, highly polished and in some cases near pornographic visual displays. Maybe that’s a good thing though, because the earnestness of these artistes, with their belief in and love for their music really shines through. Saw that part of the stretch of Lekki Expressway (very close to the new Addax HQ) has been cleared of all the traders. Maybe it happened a while ago but I just noticed it yesterday. There’s a lot of land-filling going on there. I wonder if there is going to be yet another behemoth of a building is going to be erected there causing even more traffic on the road and cancelling out any benefits of the ongoing road expansion. Maybe it’ll be a pleasant surprise instead – like a waterside park. Somehow I doubt it. Last year, APC WNSP (Association for Progressive Communications - Women's Networking Support Programme) started the Take Back the Tech initiative aimed at bringing light to the problem of online violence against women and helping people take a stand against it. As this year's 16 Days of Activism - November 25 to December 10- against violence against women (VAW) approaches, the Take Back the Tech team is soliciting for ideas for the campaign. Last year's actions included sharing stories and experiences related to VAW, celebrating sheroes, making statements on radio, online (through avatars, icons and email signatures/taglines) and sharing bookmarked websites. Visit the site to learn more. Also note that November 29th is the International Women Human Rights Defenders Day and December 10 is International Human Rights Day. My brother pointed me to this profile in The New Yorker magazine of David Simon, the creator of The Wire. It's a long juicy read and I have only finished the first page. I thought before I defer reading it to a more suitable time and eventually forget about it, where better to 'bookmark' it than my very own blog? Just read on Wordsbody that Doris Lessing has been awarded this year's Nobel prize for Literature. Doris Lessing is my favourite writer so I am very pleased to hear this. I had actually just started reading one of her classics, The Summer Before the Dark last week. Her writing has always spoken to me in a way that no other writer has. What do I watch next? Frivolous post ahoy! I haven't written about my favourite shows in a while, possibly because I didn't have anything new to watch. Last year, I bought seasons 1 and 2 of Homicide: Life on the Street, which was one of my favourite shows back in the day. I only got around to watching the DVDs this year. On my recent vacation, I bought season 3, which to my intense pleasure was 6 DVDs long. It was to my utter amazement this afternoon to realise that I was on the last disc. How did I get through the entire season so quickly? The addictive plots and wonderful writing undoubtedly have a big role to play in that. Already in mourning and wondering what I would do after I completed the season, I went online to check on the other seasons. 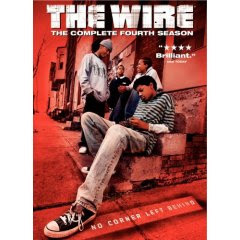 Not only did I see that all season 1 through to 7 are available, I discovered on Amazon.com that the 4th season of my fav, fav, fav show, The Wire will be released on DVD on December 4. Fans of this blog (cough, cough ....), okay regular readers will already know about my love for The Wire and all crime shows. To say that I was ecstatic is a monumental understatement. Now, I know what I want for Christmas and my birthday. I was telling a friend over the weekend how I had a lot of personal work that I needed to do, but how I seemed to lack the time and space at home to do it. I mentioned that I was considering checking into a hotel for a weekend so that I could get it all done. My friend burst out in deafening laughter. - Hehn? You have definitely hit the rock bottom of excuses. If you have so much money to waste, please come and invest in my company. I protested that I really needed to focus on my work and how I couldn't do it at home. - Come on, Ore! You just need to be more disciplined. As I mulled over that startlingly simple but incisive piece of advice, he was still chortling away. - Check into a hotel indeed!! Why does it seem sometimes that my focus and discipline comes in ebbs and flows? When I tell people that I really think I would love to be a lady of luxury and do nothing all day, they tell me that I'd be bored out of my mind. But I think I can manage enough focus and discipline to do a good job of that. Argh! The traffic in Lagos has been so bad. My journey between home and work normally takes about half an hour (and when you consider the physical distance, it shouldn't even take that). Now, if I spend just an hour, I should consider myself extremely lucky. I am far from being the only one suffering from the multiple roadwork taking place all over the city. Everyone I know is complaining. The road expansion work on Lekki Expressway is billed to last 36 months, I think, so we have quite a ways to go. It's been Bye Bye Gym, as I don't have the energy to work out after battling through traffic, competing with other cars for valuable road space, inching forward in the gridlock and praying that my car does not get scratched or scrapped by okadas and other cars. I got this a little while ago about the 9th Lagos Book and Art Festival. - Opening Reception - 50 Years Of Things Fall Apart, 10 AM, Friday, November 9, 2007. Groundbreaking ceremony for the series of worldwide anniversary events for Africa's greatest novel-starting January 2008. Reviews, readings and discussions of novels, drama and non-fiction works including Ekwensi's Divided We Stand, Chimamanda Adichie's Half Of A Yellow Sun, Dulue Mbachu's War Games, Olusegun Obasanjo's My Command, Eddie Iroh's Toads Of War, Chukwuemeka Ike's Sunset At Dawn and Rasheed Gbadamosi's Echoes From The Lagoon. Music, Wine and Dance For Fatai Rolling Dollar at 80, Bruce Onobrakpeya at 75, Femi Asekun at 75, Tunde Oloyede at 60, Yemi Ogunbiyi at 60. Brenda Zulu is a journalist who writes on ICT (information and communication technologies), especially with how it relates to African women. I like to read her blog whenever I can. She has made a number of recent posts about last month's Digital Citizen Indaba conference, which explored digital media and Internet technologies and their place in Africa. The interviews make for interesting reading. Comp time! I received an email from Ken Banks, the founder of the FrontlineSMS system was used to monitor last April's elections. This time, he's spearheading nGOmobile, a text message-based competition aimed at grassroots non-profit organisations working for positive social and environmental change throughout the developing world. The competition wants to encourage NGOs to think more about how mobile technology could be applied in their work. NGOs from developing countries are invited to submit a short proposal outlining how text messaging could make their job easier. The competition closes on the 14th of December 2007. Check the website for info on how to apply.